Hiya guys! I hope you've been having a lovely long weekend if you're in the states. Usually on a day off from work I tend to take the day away from blogging as well. But not this time, not when I can finally tell you the secret I've been holding on to for a year. And if you know anything about me, then you know that's damn near torture. Haha. 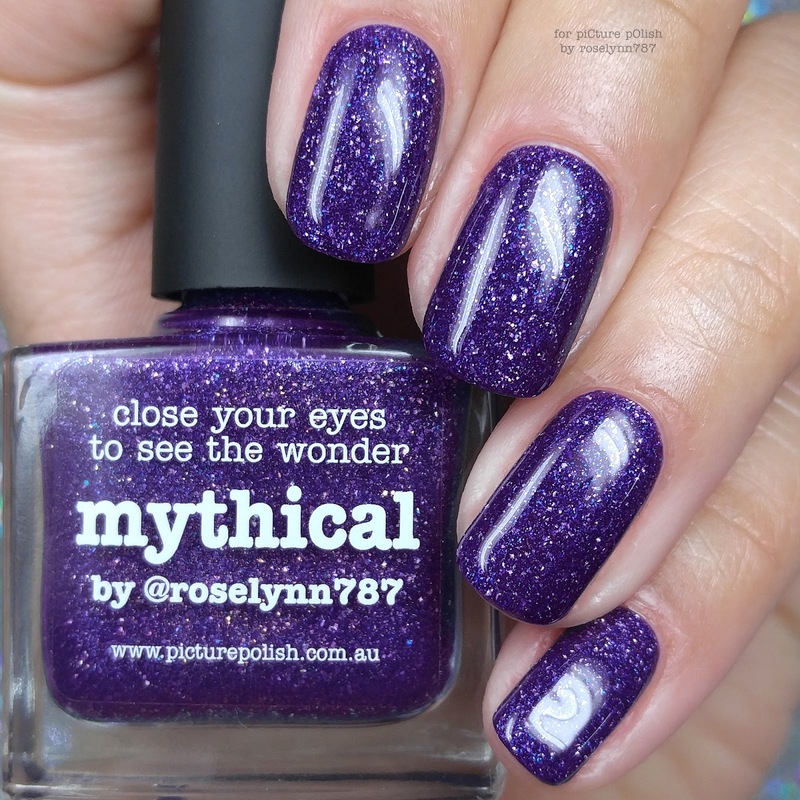 Today I'm sharing swatches for Mythical by Picture Polish, which is MY collaboration shade! Talk about a heck of a secret to be holding on to, eh? But yes, I've worked along side Jules to make my vision into a reality. I've definitely put a lot of myself into this shade, which of course makes it all the more nerve wrecking. I really want you guys to love it as much as I do. But enough stalling, now it's finally time to share it with the world! Without further ado, let's get to the swatches! 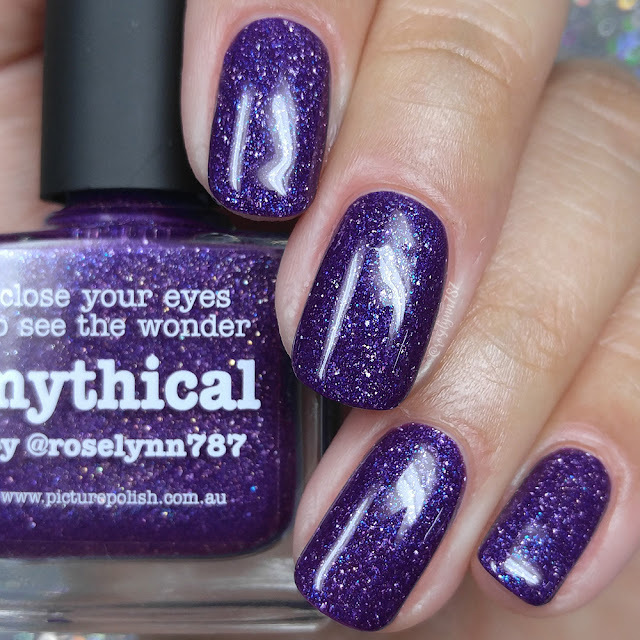 Mythical by Picture Polish is now available for purchase along with the other five blogger collaboration shades. Each full-size 11mL retails for $14.00 AUD, which is approximately $11.13 USD. When life gets too hard, you have to just close your eyes and envision a new place. A place where fairies, mermaids, and unicorns surround you… a place that is simply mythical. For as long as I can remember I have been a lost in a world inside my own imagination. 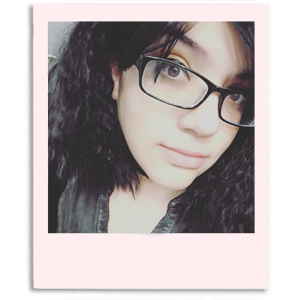 I grew up as an only child and with no family except my parents. There was no one my age to play with or much less talk to. So that's when I started daydreaming of this place... A place where you'd look up and see the sun and the moon at the same time. It was a place of mermaids, fairies, and any other mythical creature you could think of. But most importantly, it was a place where nothing could ever go wrong and I could never be hurt. Even as an adult... or more like ESPECIALLY as an adult, I find myself drifting into this place. Into this place of dreams and magic, a place I feel will always hold my heart. And now I hope this place can reach you and we can explore it's secret caverns together as we escape into the mythical. 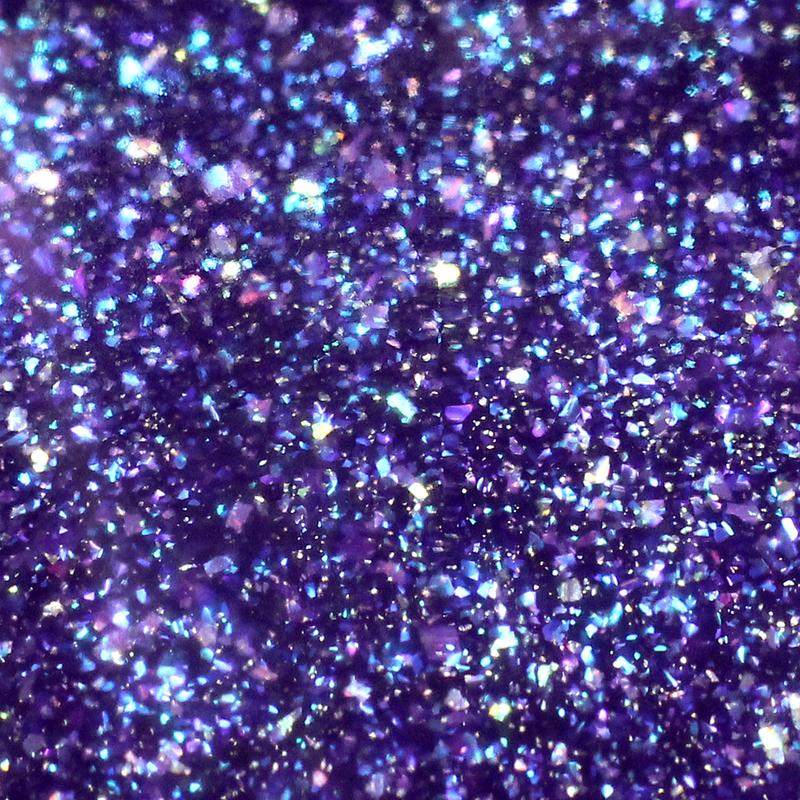 Mythical can be described as a purple jelly scatter holographic with shifting blue glass flecks. 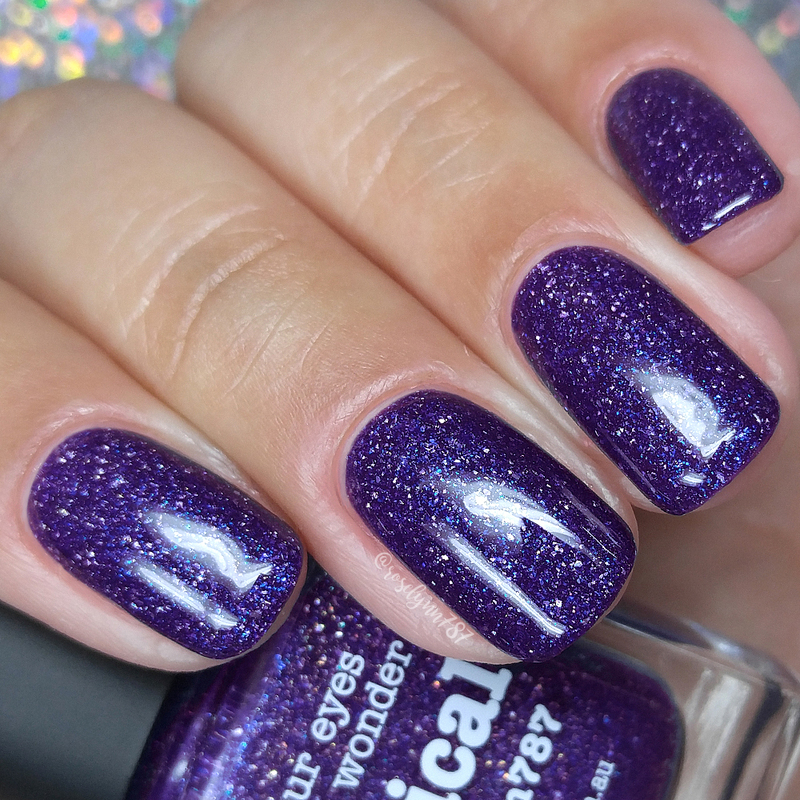 One of the most important elements of this polish was the color shifting in the flecks. I wanted it to capture that same glint that you'd get from seeing something out of the corner of your eye. Something you think is there, but you can't be sure and so it lingers with you. It's subtle, but if you see it at just the right angle it absolutely glistens and comes to life! And for the base I went with a rich purple to create a nice contrast against the blue flecks. It was also important to me that I went with a color that would appeal against a variety of skin tones. I really hope I accomplished that! The formula has a pretty good opacity, although not enough to be a one coater. Consistency wise it's pretty balanced, not too thick or too thin. There is plenty of flecks per brush stroke that apply evenly across the nail. It dries down to a minimal gritty finish, but smooths out perfectly after topcoat. I experienced no staining on removal to either my nail beds or cuticles. Shown in two coats and sealed with a glossy topcoat. Thank you so much Jules and Picture Polish for working with me in creating this shade. It has been a literal dream come true every step of the way. I hope you guys love this polish as much as I do. Of course, I would definitely love to see you wear it so be sure to tag me in your manis. To recap, Mythical by Picture Polish is now available for purchase along with the other five blogger collaboration shades. Each full-size 11mL retails for $14.00 AUD, which is approximately $11.13 USD. Wow! What an honor and your shade is STUNNING!!!! Congrats! Congratulations Roselynn! I was so excited to see one of them was yours. It's a gorgeous creation! Congratulations on a beautiful shade! I love purple and blue and the inspiration is awesome! So congrats to you!! You totally deserve it! This is a gorgeous polish and you did an amazing job on it!